HHS Report: Don't forget the Medicaid Determinations!! In all the hullabaloo over the monthly HHS report yesterday, not a whole lot has been said about the Medicaid/CHIP side of things. Medicaid/CHIP enrollment has always been much trickier to pin down than private QHPs, partly due to the high "churn" rate of people moving onto & off of it, partly due to about 40% of the states not having implemented any version of ACA Medicaid expansion anyway, partly due to the headache-inducing rules for eligibility and nightmarish paperwork hoops people have to jump through to enroll in some states. Read more about HHS Report: Don't forget the Medicaid Determinations!! Worth Noting: There's at least 1.7 million QHP applications still out there. In all the fuss and bother over yesterday's monthly HHS report (which only ran through the 15th), I almost forgot about the HC.gov-only "weekly snapshot" which was also released at the same time. This report only covers the 37 states run via the federal exchange, but is more recent; it goes all the way up through December 26th, just 5 days ago. Read more about Worth Noting: There's at least 1.7 million QHP applications still out there. Yesterday I officially confirmed 77,548 QHP selections via the MA Health Connector as of midnight Sunday the 28th. They just released today's daily dashboard report, and the QHP eligibility determinations have gone up by another 6,263 people. Every day since Nov. 15th, roughly 50% of the QHP determinations have gone on to actually select a plan that very same day; the rate has ranged from 45% - 55% but always hovers near the 50% mark. Assuming this is still the case, that should mean at least 3,100 more QHP selections as of last night, for a total of around 80,600 to date. In addition, MA has confirmed 139,063 new Medicaid/MassHealth enrollees, which have immediate effect. As a side note, this means that MA has now enrolled more than 2.5x as many people in private plans for 2015 as they did all of last year. The following numbers are up-to-date as of 11:59pm Tuesday, December 30, 2014. Renewals: 23,356 individuals have been checked out into 2015 health plans. New to Vermont Health Connect: 6,881 individuals have been checked out into 2015 health plans. The following graph shows where new applicants are in the process between submitting their application and being covered by a qualified health plan. Please note that applicants who qualify for Medicaid are not included. The numbers are up-to-date as of Monday, December 29, 2014. I know I said I would save any further analysis of today's monthly HHS report until tomorrow, but when I started plugging in the state-by-state numbers, I came up with some really strange discrepancies between the QHP selection number in the report and the corresponding report from some of the state exchanges for the same date. It got to be so strange that I actually whipped up a little spreadsheet for all of the state-based exchanges (minus Massachusetts, which is a special case anyway; plus Oregon, which is running off of HC.gov this year but has a large discrepancy from the official State of Oregon Website which is reporting enrollments this year as well). The yellow lines are the states I'm most concerned about (the others all have either obvious explanations or are minor enough not to worry about). Afterwards I'll run through the problems with each one. OK, I actually have 3 different sources for these Massachusetts numbers, and the dates and classifications overlap a bit so bear with me. First, we have today's daily MA Health Connector Dashboard report, which states that there have been 148,453 QHP determinations thorugh yesterday (12/29). Assuming 50% of these have selected plans, that's around 74,200 QHP selections to date. In addition, the 134,803 Medicaid (MassHealth) enrollments are already locked in. As of Dec. 28, a total of 146,529 Marylanders have enrolled in quality, affordable health coverage for calendar year 2015 since the 90-day open enrollment period began Nov. 15. That includes 83,735 individuals enrolled in private Qualified Health Plans (QHP) and 62,794 individuals enrolled in Medicaid. At 83,735 enrollments so far, MD has now enrolled 24% more people than they did during all of the 2014 open enrollment period (67,757 thru April 19th). Put another way, they've enrolled 375 people per day since their January deadline, which is still 11% faster than the 338/day they averaged during the first open enrollment period (including the December and March surges). Add another 62,794 to Medicaid and MD's turnaround for 2015 is quite impressive indeed. So, let's start out with one of the less-obvious updates: Medicaid expansion in Michigan. About 2.3 million Pennsylvanians are currently enrolled in Medicaid, Gillis said, and as of Dec. 22, about 88,000 households had applied for Healthy PA, with approximately 30,000 additional applications sent to the state from healthcare.gov. The number of applications from each county is not yet available, Gillis said. The department is still processing applications but, she said, most of the new sign-ups are going into the Private Coverage Option, which is for people who are newly eligible because Healthy Pa.’s income limits — 133 percent of the federal poverty level, with a 5-percent income disregard — will be broader than Medicaid’s are. PA has around 600K residents eligible for the expansion program, so that's about 20% who have already signed up so far. Maryland: 83K QHPs, 61.5K Medicaid: STILL enrolling at a faster rate than last year! Maryland's previous update, which included their 12/18 deadline for January coverage was just shy of 80K QHPs, or an average of 2,353 enrollments per day since 11/15. Read more about Maryland: 83K QHPs, 61.5K Medicaid: STILL enrolling at a faster rate than last year! Merry Christmas! If you check out The Graph today, you'll note that today's update, in addition to adding yesterday (12/24), of course, also features a 4th color-coded section labelled "Confirmed via Healthcare.Gov". I thought about whether to add this or not for some time. One of the complaints about the 2014 Graph was that while it was comprehensive, that also meant it was far too confusing for many people, with up to 8 different colored sections & labels all over the place. For 2015, I overhauled the format by a) separating out Medicaid/CHIP onto their own Graph and b) getting rid of off-exchange and SHOP enrollments entirely (at least until I have decent numbers for them). This left just 3 main data points: Total Estimated QHP selections, Total Estimated Paid QHPs and Total Confirmed QHP selections. I also added a dashed-line projection for how many of these I estimated were from the federal exchange (HC.gov) out of the total nationally. MA has extended the payment deadline until 12/28, so the other 34K still have 5 days (including today) to make their first payment; if they miss that deadline but still pay up, they'll still be covered starting on February 1st. Assuming 25,200 of these folks make their first payment by the 28th, they'll hit my 88% "rule of thumb" rate for January. Over 8,100 people made payments yesterday alone, so I'm not terribly concerned about this issue. It'll be interesting to see how many make the cut, given all the "but how many have PAID???" fuss and bother last year (last year, MA & WA were the only states which reported paid only numbers to HHS, but it was still messy in MA's case given their technical problems). Renewals: 22,640 individuals have been checked out into 2015 health plans. New to Vermont Health Connect: 5,663 individuals have been checked out into 2015 health plans. Today is the final day for Massachusetts residents to enroll in a private healthcare plan if they want coverage to start on January 1st. As of last night, they had a total of 248,711 eligibility determinations, of which 131,732 are for private QHP policies (the other 117K have already been enrolled in Medicaid, aka "MassHealth", which is impressive in and of itself). So, how many of those nearly 132K people have actually selected a plan? Well, since open enrollment started on 11/15, anywhere between 45-55% of total QHP determinations as of that day have also selected a plan. If that was the case here, I'd say that the number is around 50%, or around 66,000, which would be an impressive 4,600 spike over yesterday's confirmed 64.1K. UPDATE: OK, I've received the official total: As of midnight last night, 67,759 people had selected a policy, or 51.4%. I've also confirmed that about 47% had paid their first premium already...32,000 people, or more than the total enrollees as of last April. Read more about BREAKING: 6.4M QHPs as of 12/19 w/1.9M Renewals...on HC.gov ONLY!! Read more about What I expect to be announced today...maybe. Here's my wish list for "Hanukkah Harry"
Dear Hanukkah Harry: More Enrollment Transparency & Consistency, Please! Read more about Here's my wish list for "Hanukkah Harry"
Read more about Vermont needs a $2.5B Kickstarter Campaign. ...the "domain solution" I describe above would still have one more hurdle, of course: You'd still have to get the individual states to agree to pony up $9.95 per year and set up a simple domain redirect. Illinois has already done so; presumably other blue-leaning states would follow. That would leave about 30 states, give or take, including Texas, Florida and so forth. One persistent Obamacare fear, for years now, has been that the new law would decimate the employer-sponsored insurance system. Why would companies waste money on buying coverage for their workers, the argument goes, when they could hand these people off to Obamacare's new exchanges? And some high profile companies like Walmart went through and did this, leading to much speculation about whether Obamacare would kill employer-sponsored coverage. New research from the Urban Institute suggests that, at least in year one, companies like Walmart were the exception rather than the norm: employer-sponsored coverage held steady through the Affordable Care Act's launch. I'm not sure what to make of this. "Over a million people enrolled" it says. The embedded image specifically refers to 2015 coverage (and of course that's what they're pushing hard right now). Yet the most recent HHS Dept. weekly "snapshot" report has the number of plan selections as 2,446,562. So, what does "over a million" refer to? Well, it could be a couple of things. It's most likely referring to the 48% of those who are new enrollees (around 1.17 million)...but if that was the case, it would make more sense to me to include the confirmed renewals for 2015 as well and say "more than 2.4 million enrolled." A quick reminder: If you live in Idaho or New York, today is the deadline to enroll in a private healthcare policy if you want coverage starting on January 1st, 2015. If you live in any other state, you have until January 15th to enroll for coverage starting on February 1st. Massachusetts: I overestimated QHPs, but official total still excellent! OK, it looks like my theory about MA's "QHPs as % of Determinations" theory was wrong; I assumed that it would have started increasing from 50% over the past week, intstead it dropped to about 48% (or held steady at 52% if you include the "plans in cart" which neither I nor the MA exchange is doing anyway). Therefore, the bad news is that the official total is around 8,300 fewer than I thought: 53,490 thorugh yesterday. The good news is that this is still an excellent number, and there's still tens of thousands of people who've started the process who have until next Tuesday to wrap it up. In addition, remember my snark from 11/16 about "ONLY 3.5% HAVE PAID!!"? Well, guess what: That percentage is up to 34%, and they still have 5 days to pay (I presume they're dealing with a flood of payments at the moment). The Medicaid tally holds at 98,530 since it doesn't include yesterday. Read more about Massachusetts: I overestimated QHPs, but official total still excellent! Read more about Maryland: Holy Guacamole! 80K QHPs!! The 51 states (including the District of Columbia) that provided enrollment data for October 2014 reported nearly 68.5 million individuals were enrolled in Medicaid and CHIP. This enrollment count is point-in-time (on the last day of the month) and includes all enrollees in the Medicaid and CHIP programs who are receiving a comprehensive benefit package. 428,311 additional people were enrolled in October 2014 as compared to September 2014 in the 51 states that reported comparable September and August data. Chalk up another 4,433 QHP eligibility determinations for MA yesterday. Assuming 60% of those have selected a plan, the cumulative total for 2015 should be up to around 61,800 people to date. As of mid-April, Massachusetts had only enrolled a total of 31,695 people. That means that assuming I'm close, the Bay State should double their 2014 QHP enrollment by tomorrow. In addition, their Medicaid enrollments are closing in quickly on the 100K mark (98,530), and should easily cross it tomorrow as well. Exhibit A: I'm way behind on several projects from, you know, my day job. Exhibit B: As you can see from The Spreadsheet, the enrollment data from every one of the state-based exchanges is current within the past week (WA is from 12/10, VT from 12/11, RI from 12/13 and all others are from the 14th, 15th or 16th). Therefore, aside from the daily dashboard from Massachusetts (or if there's some huge ACA enrollment development), I'm taking the day off. The Hawaii Health Connector enrolled 3,500 people in its first month of open enrollment, which ended on Monday, the exchange confirmed Tuesday. The state's online health insurance exchange saw more than an eleven-fold increase in enrollment in comparison to its first month of enrollment last year, when the just 300 signed up for health insurance on the Connector. ...To date, roughly 13,500 residents have signed up for health insurance coverage that will begin on Jan 1. Kissel noted that the Connector has also connected 50,000 to the expanded Medicaid program, which came in with the Affordable Care Act at no cost to the state. DENVER, CO – In the first month of Open Enrollment, 136,315 Coloradans enrolled in healthcare coverage for 2015, either in Medicaid, Child Health Plan Plus (CHP+) or in commercial health insurance purchased through the state health insurance Marketplace, according to new data released today by Connect for Health Colorado® and the Colorado Department of Health Care Policy and Financing. Dec. 15 was the deadline for individuals and families to select plans for coverage to begin on Jan. 1. Connect for Health Colorado will continue working with those who started their application by Dec. 15 to help finish it so they can be covered by the New Year. Customers also have to take the last step to ensure their coverage: make the first payment on time. Just over a month into open enrollment at HealthSource RI, nearly half of the people who purchased health insurance in 2014 have renewed coverage for another year, the state-based exchange created under the Affordable Care Act announced Wednesday. Through Dec. 13, 9,825 people, or 48 percent had renewed coverage, with close to 60 percent opting to switch to different plans. Another 2,522 have signed up for health insurance for the first time, bringing total enrollment to 12,347. Massachusetts continues to chug along, with another 4.243 QHP eligibility determinations; assuming a minimum 60% plan selection rate, that should add another 2,500 or so to the total, for around 59K QHPs to date. Hmmm...MNsure is currently enrolling people at 3x the rate they did all of last year. Assuming that this doesn't include automatic renewals, that's pretty good. They bumped their enrollment deadline for January coverage out until Friday afternoon (4:30pm, for some reason), which is even better. UPDATE: According to this Modern Healthcare article, only about 42% of MN's enrollments to date are renewals. In one sense, this is good since it suggests that they still have a good 31K potential renewals to work with. SACRAMENTO, Calif. — More than 592,000 people sought coverage and were determined eligible for private health insurance and eligible or likely eligible for Medi-Cal in the first month of open enrollment, Covered California and the California Department of Health Care Services announced Wednesday. The consumers, who applied for coverage through Covered California since open enrollment began on Nov. 15, include 157,361 eligibility determinations and an additional 144,178 plan selections for private coverage, as well as 216,423 enrollments into Medi-Cal coverage and 74,965 who are likely eligible for Medi-Cal. So far in 2014, Medi-Cal has enrolled more than 2.2 million consumers. Wow! This was unexpected; while several other states have provided enrollment updates today, and some have broken out (or at least included) both new enrollments as well as manual renewals/re-enrollments, Kentucky is the first one to include automatic renewals as well! Webb is one of 101,114 Kentuckians who have newly enrolled or re-enrolled in Obamacare health plans during the first 30 days of open enrollment through the state's health insurance exchange, kynect. State numbers released late Tuesday afternoon show that 16,139 residents met eligibility requirements for Medicaid, 9,215 newly enrolled in qualified health plans and 75,760 auto-renewed last year's private kynect health plans since re-enrollment began Nov. 15. Idaho manages to enroll 98% of 2014 QHP total in first month!! BOISE, Idaho – During the first month of open enrollment, Your Health Idaho processed 74,689 enrollments, which includes new applicants and those renewing coverage for 2015. The numbers released by Your Health Idaho at its Tuesday board meeting include enrollments processed from November 15 through December 14. For comparison, last year Idaho enrolled 76,000 people for the entire enrollment period. That's right: They managed to essentially equal 6 1/2 months worth of private policy enrollments in just 1 month...and that doesn't include the surge from yesterday (or for the following 5 days, since ID's deadline isn't until the 20th). Read more about Idaho manages to enroll 98% of 2014 QHP total in first month!! Read more about CMS Conference Call: Liveblog! BALTIMORE (Dec. 16, 2014) — The Board of Directors of the Maryland Health Benefit Exchange (MHBE) today celebrated the progress of the Maryland Health Connection one month into its open enrollment. More than 100,000 Marylanders have signed up for 2015 health coverage. Maryland Health Connection has enrolled 105,902 people — including 61,031 in Qualified Health Plans (QHPs) and 41,871 in Medicaid. By comparison, during the first open enrollment a year ago, 1,278 Marylanders enrolled in private QHPs through the marketplace during its first 30 days. Last Friday I bumped up my own 2015 QHP projection from around 12.0 million as of 2/15/15 up to 12.5 million. As you can see on The Graph, I'm also assuming roughly an 88% payment rate (ie, how many of those 12.5M I expect to pay for their first month's premium), which should be roughly 11.0 million even. However, there's one number missing, which I left off in the interest of avoiding confusion: How many I expect to still be enrolled by the end of 2015. This is pretty simple, though: Around 10.5 million. How do I arrive at that number? Well, this year the net attrition rate resulted in around 6.7 million people still being enrolled nationally as of mid-October. That's around 84% of the 8.0 million "total" enrollment figure as of last April. In other words, out of 8 million people, about 12% never paid and another 4% gradually dropped off the exchanges by October. Assuming a similar pattern next year, 84% of 12.5 million is 10.5 million who should still be enrolled via ACA exchanges as of next October. I'm actually a bit curious about the "new" specification here. Last week the head of the HI exchange gave an interview in which he gave the number as being 12,000, but it turned out that was a cumulative number which included all of the enrollments from last year (whether they had renewed yet or not) as well as the new additions. I thumbnailed it as being around 1,200 enrollments for 2015. Hawaii: Hawaii Health Connector has enrolled nearly 1,500 new residents as of Dec. 5. Last year glitches to the website caused enrollment to be delayed by two weeks. According to HealthInsurance.org, the state’s uninsured population has gone down from 8 percent of the population to 6 percent of the population since Obamacare went into effect..
District of Columbia: DC Health Link has enrolled 1,413 people, both new and renewed applications, according to data collected by last week Kaiser Health News. Grammar aside, I'll assume "last week" means "through Friday the 12th". Connecticut: Last year the state's uninsured rate dropped by about half – from nearly 8 percent to 4 percent. Likely for this reason Kevin Counihan, the CEO of Access Health CT, was scooped up by the federal government to help fix Healthcare.gov. Latest figures for this year come from Dec. 12, which showed 39,000 new Medicaid enrollees and 13,000 new private health plans, according to an email from a state official. Late Monday, Access Health CT announced that it was allowing a grace period until Dec. 19 for enrollment that would begin January 2015. Consumers who had started an application before Monday could have four additional days to fill out their information. That's 13K new enrollees only; again, it's safe to assume at least a 1:1 ratio between new & renewed enrollees, so I'm calling it at least 26K total for CT so far. A nice update out of California...but still a frustrating one. They held an executive board meeting today at which they posted an updated QHP selection total for 2015: 91,693 as of 12/11/14. Unfortunately, this still doesn't include any renewal data for existing enrollees. As I noted last week, however, I'm extremely confident that CA's renewals/re-enrollments are running easily at the same rate (or potentially as high as 4x as many) as new additions, so I'm very comfortable doubling this number to at least 184,000 total QHP selections as of the 11th. Wow! I'm impressed! I know Massachusetts said they'd be issuing daily enrollment reports during weekdays, but I really didn't think they'd have time to do so today. Then again, their deadline isn't until next Tuesday (the 23rd), so I guess things aren't too crazy in the Bay State. Well, they haven't officially updated the "QHP plan selection" tally in a week or so, but I'm reasonably certain that the % of "eligibility determinations", which had been hovering around 50-55% until about a week ago, should have worked it's way up to perhaps 60% in recent days. Assuming I'm correct about this, their QHP selection total should be roughly 52,600 by now, though I'll knock off 600 out of caution and go with 52K even. Again: During the 2014 open enrollment period, MA only nabbed less than 32K during the full 200-day period, so they're already 60% ahead of last year less than 1/3 of the way through this one. Meanwhile, they've also added 84K people to Medicaid as well. “The deadline to sign up for quality, affordable health care coverage that begins on January 1, 2015 is tonight at midnight. If customers have an application started and select a plan before midnight tonight, they can still get coverage beginning January 1, as long as they complete the application and get us all the relevant information by midnight this Friday, December 19. I spent a few minutes this morning poking around all 15 ACA exchange websites (HC.gov plus the 14 state-run websites). Obviously I didn't go through and actually create an account or enroll/renew in any of them (although my wife and I did renew our own coverage via HC.gov on Saturday, and everything went fine). However, I at least visited all of the sites and clicked through as far as I could go without actually setting any accounts up. For the most part, everything went smoothly. Yes, some of the sites have more confusing layouts/navigation than others, but my main concern was whether they load at all, how quickly pages load, whether any glitches or broken links pop up and so on. Midnight Monday, Pacific time, is the deadline for new customers to pick a health plan that will take effect Jan. 1, and for current enrollees to make changes that could reduce premium increases ahead of the new year. HealthCare.gov and state insurance websites are preparing for heavy online traffic before the deadline, which gives consumers in the East three hours into Tuesday to enroll. Thanks to contributor farmbellpsu for the heads' up. Doing nothing appears to be a particularly bad idea for people who turned 21 this year, according to the Center on Budget and Policy Priorities, a Washington group that advocates for low-income people. Read more about WTF??? Idaho "extends" their deadline until 12/20...but they had previously said it was 12/23 in the first place?? Oregon: 27K QHPs via HC.gov...plus another 18K off-exchange! ​The Insurance Division will collect enrollment information from carriers each week throughout 2015 open enrollment. Updated numbers will be posted each week on this web page. Read more about Oregon: 27K QHPs via HC.gov...plus another 18K off-exchange! Next up for Medicaid Expansion: Utah, Wyoming and...Alabama??? Two of the most heavily Republican states, Utah and Wyoming, appear to be moving closer to an expansion of Medicaid under the Affordable Care Act. Other GOP-dominated states, like Indiana and Tennessee, are also looking more closely at it, despite the hostility of their party’s leaders toward Obamacare. ...Gov. Matt Mead of Wyoming, where Republicans hold 78 of 90 seats in the legislature, acknowledged his opposition to Obamacare but said the statehad to be realistic by embracing Medicaid expansion in one form or another. “I don’t think we can say to those people in Wyoming who are working [and] who cannot get insurance that we’re not going to do anything,” he said. Read more about Next up for Medicaid Expansion: Utah, Wyoming and...Alabama??? Hmmmmm...MA has switched their weekly reports from Mondays to Fridays, which is fine...except that until now the weekly versions also included actual hard "QHP plans selected" data. This one...doesn't. It includes all the other weekly stuff but not the actual plans selected (aka "total enrollments" by my lingo). As a result, I'll still have to do an estimate based on the Eligibility Determinations...which in this case is a total of 83,988. Assuming that the % of QHP determinations which have already led to actual plan selections is up to around 60% per day by now (up from around 52% a week or so ago), that should mean roughly 44,800 QHP selections to date. To be cautious, however, i'll knock it down to an even 44K for now. And, again, Medicaid (MassHealth) enrollments are already up to 72,175 people. The following numbers are up-to-date as of 11:59pm Thursday, December 11, 2014. Renewals: 21,788 individuals have been checked out into 2015 health plans. New to Vermont Health Connect: 4,079 individuals have been checked out into 2015 health plans. OK, so that's 25,867 total so far...of which 84% are renewals vs. 16% new enrollments. Unfortunately no breakout between the two yet...hopefully soon...I also don't know what date that number runs through, nor do I know if the QHP tally includes new enrollments only (a la California & Connecticut) or if it also includes renewals as well. @charles_gaba State also says deadline to enroll for jan. extended to Dec. 20 b/c of "extreme weather"
Overall, 14,415 QHPs in 28 days is quite good: 514 per day on average, or about 2.1x the average daily rate for the 2014 open enrollment period. In addition, they've added, 19,015 Medicaid/MinnesotaCare enrollments. OK, I've been considering this for a few days now, but I wanted to wait for the actual 3rd week HC.gov snapshot to come in before committing to it. Until now, I've kept my 2015 Open Enrollment Period projections pretty solid: 7.0 million by Dec. 15th; 8.0 million by Jan. 15th and 12.0 million by February 15th. Of that 12.0 million total, I figured that around 88% will (eventually) pay for at least their first month's premium, or around 10.6 million. Hmmm...on the surface these numbers seem fairly clear: 8,058 QHPs, 20,942 Medicaid. However, the wording of the article, combined with the fact that 8K in 26 days is only 310/day so far (versus 2014's 396/day average) makes me suspect that this only refers to new enrollments and doesn't include renewals of existing enrollees. In addition, the previous data release by AccessHealthCT clarified that it only included new enrollments. If this only includes new enrollees, then the odds are that the total number is actually at least double that (16K+) and likely more like 20K+. BOOM, there it is: Washington State has been pretty quiet on the update front, due, no doubt, to having to clean up a rather embarrassing screw-up on the part of their IT systems integrator a week or so ago when over 6,000 account enrollments/payments were accidentally cancelled. *Note: These numbers reflect QHP enrollments through Dec. 10 and Medicaid Enrollments through Dec. 4. Until now, I've relied on states like Maryland, Massachusetts and Vermont, which have given out frequent 2015 enrollment updates, to point out how impressive the enrollment stats have been this time around; Maryland and Vermont are currently running at nearly 5x their 2014 pace, while Massachusetts is adding people at an astonishing 10x their 2014 rate. However, these are pretty misleading, because all 3 of those states had such Godawful websites last year that it didn't take much to outperform this year. On the surface, this looks pretty good, but nothing jaw-dropping. 24,811 in 27 days is 919/day, or about a 50% improvement over 2014's 627/day. I'll update this if the hard numbers are provided. Hawaii: Either 1,200 (yay)...or 12,000 (holy crap!) UPDATED: It's 1,200. Well, this news is either moderately interesting or jaw-droppingly awesome, depending on what the actual number is. When you visit the link, it goes to a video interview with the executive director of the HI exchange, who states, when asked "do we know how many signups there've been so far?" that "it's about 12,000; we were at 250 this time last year, so we've made a lot of progress." Now, hold the phone a minute. According to the Kaiser Family Foundation, Hawaii only has around 53,000 residents total who are even eligible to enroll via the ACA exchange to begin with. Read more about Hawaii: Either 1,200 (yay)...or 12,000 (holy crap!) UPDATED: It's 1,200. Pennsylvania: ACA Medicaid expansion already at 27K "households"
I don't know exactly how many individual people a "household" represents, but I've typically used a 1.8x multiplier to be very cautious (the Census Bureau uses 2.63x). That suggests the actual number of PA expansion enrollees is more like 49,000 people in just the first week, which would be a fantastic start. The Corbett administration reached an agreement with the federal government this year to launch the Healthy PA program in lieu expanding Medicaid. Open enrollment in the program has started and coverage will take effect Jan. 1. However Governor-elect Tom Wolf says he will scrap Healthy PA and opt in to Medicaid expansion. The impending switch apparently has confused many low-income Pennsylvanians, and some are sitting on the sidelines rather than signing up for coverage. “The most important things is for people to enroll and to get their names on the list,” said State Rep. Vincent Hughes (D- Philadelphia). “If they are not on the list then they won’t get the coverage." Despite the confusion, more than 27,000 households applied for coverage in the first week of enrollment, which began Dec. 1. Read more about Pennsylvania: ACA Medicaid expansion already at 27K "households"
California State-Level Projection: 397K QHPs through 12/08/14? I've received official confirmation that CoveredCA will give their first official 2015 Open Enrollment Period data report tomorrow (Wednesday) morning. 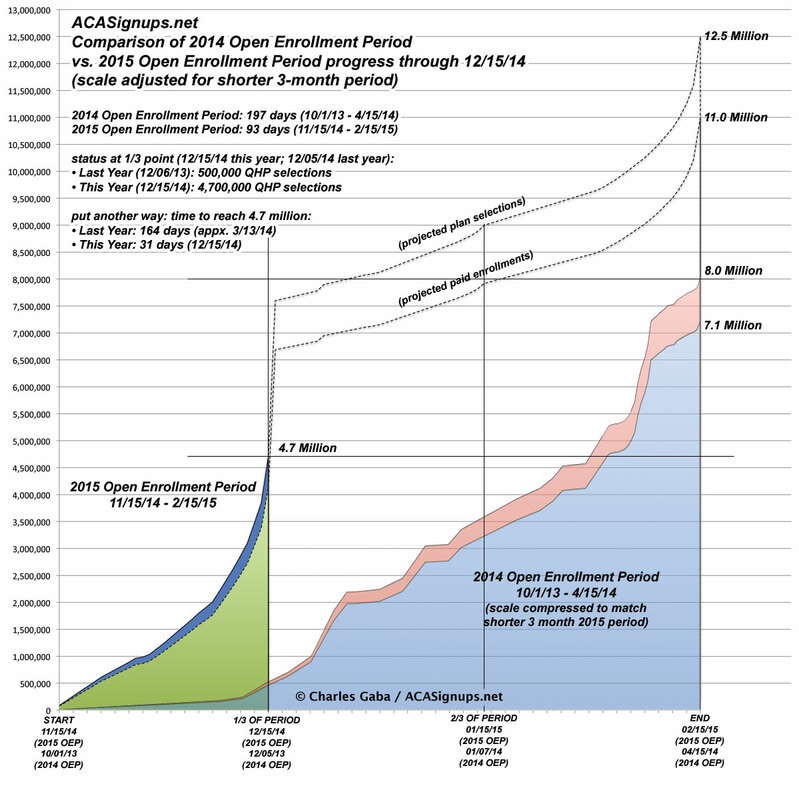 ...CoveredCA's total through 12/08/14 should be around 397,000 QHP selections. We'll see how close I come. Read more about California State-Level Projection: 397K QHPs through 12/08/14? Again, I don't have the hard QHP selection numbers for the past 5 days, but assuming 60% of the QHP determinations have also selected a plan, the total should be roughly 39,300 as of last night. Massachusetts is now on track to enroll a minimum of 154,000 people...and that's not including the mid-December/mid-February surges which are sure to come. Read more about HOLD EVERYTHING!! Pres. Obama lets an important number slip on Colbert?? Pennsylvania is about to suffer from whiplash with their version of Medicaid expansion; outgoing GOP Governor Tom Corbett set it up as an Arkansas-style "private option" program, but incoming Democratic Governor Tom Wolf plans on switching everything back over to "standard" Medicaid expansion after he takes office, so things could get a bit confusing for awhile. Gillis said people have reached the call center, but calls were taking longer than expected, with some taking two hours or more. Meanwhile, she said the online enrollment process is working well. She said the state received 11,500 applications during the first two days of enrollment. There is no enrollment deadline, but people who want coverage on the first day it's available, Jan. 1, must enroll by Dec. 15, Gillis said. Read more about Note to 35* States Running off of HC.gov: My "Denny's Grand Slam" Solution is only TECHNICALLY easy, not LEGALLY so. Hmmm...for some reason, the MA Health Connector chose to give a daily report today instead of the weekly report which they've been doing on Mondays. On the one hand, this is OK because it still includes the daily breakdown of QHP determinations. On the other hand, the weekly reports gave the hard QHP selection numbers, which aren't included here. Meanwhile, Medicaid (MassHealth) enrollments have broken the 60K mark; I've been informed that these are effective immediately. Read more about The December Surge Has Begun. Last year, the Kaiser Family Foundation ran an in-depth report which broke out a rough estimate of how many people in each state fell into various ACA categories (Medicaid expansion, eligible for QHP tax credits, not eligible due to being an undocumented immigrant, "Medicaid Gap" and so on). Based on that report, it looked like the total number of currently (at that time) uninsured people eligible for Medicaid--whether via expansion or "woodworker" status--was around 14 million, plus another 4.8 million who fell into the Medicaid Gap for non-expansion states. OK, the headline and lede paragraph are pretty lame since they make it sound like Oregon's OE2 enrollment is down 90% from last year. This is pretty stupid, of course, since it only covers the first 2 weeks of a 93-day enrollment period, and since there will obviously be a huge spike in enrollments late next week and then again in mid-February. Cover Oregon officials say just 7,200 Oregonians had selected a private health insurance plan through the federal portal by the end of November. About 77,000 Oregonians were enrolled through Cover Oregon in 2014. A total of 105,000 actually enrolled but some dropped off due to cancellations and terminations. Here's your weekly @MNsure enrollment update. 20,909 total enrollments. 7,829 in QHPs, 3,340 in MinnesotaCare and 9,740 in MA. The following numbers are up-to-date as of 11:59pm Wednesday, December 3, 2014. Renewals: 15,595 individuals have been checked out into 2015 health plans (out of 38,704 in the renewal pool). New to Vermont Health Connect: 2,140 individuals have been checked out into 2015 health plans. By an amazing coincidence, this is also very close to the net reduction in the number of people who have gained healthcare coverage since the ACA was signed into law. Time to Start Rattling Some State Exchange Cages. Where the heck are CA & NY?? Oh for the love of...I spent a solid year screaming at HealthCare.Gov to start releasing their data on a regular basis; they finally did so, and now Covered California has decided to go radio silent instead. This is, quite simply, unacceptable. In California, however, officials at Covered California, the Obamacare exchange here,haven't provided updates since Nov. 20, when they released data for the first four days of the new open enrollment session. Covered California released those preliminary figures Nov. 20, when Executive Director Peter Lee revealed that 11,357 people signed up for private health plan coverage between the Nov. 15 beginning of this year's open enrollment period and Nov. 18. ...Since Nov. 20, there have been no new updates, and officials don't expect to announce new figures until mid- to late December, at the earliest, and possibly not until January. Read more about Time to Start Rattling Some State Exchange Cages. Where the heck are CA & NY?? Surprise! Not all ACA exchanges have a Dec. 15th cut-off for January coverage! I actually feel rather stupid about not looking into this earlier, but now's as good a time as any: In my latest post over at healthinsurance.org, I go over the various deadlines for both enrolling and making initial premium payments for January 1st, 2015 exchange policy coverage (and how this factor might impact my QHP projections). Take a look! Read more about Surprise! Not all ACA exchanges have a Dec. 15th cut-off for January coverage! NOTE: I've decided to make "Short Cuts" the standard name for ACA-related stories which are interesting but which I just don't have time to do full write-ups on. I've also given up on trying to cram the headlines of each story into the blog entry title. ObamaCare outreach campaigns across the country are diving deeper into the hard-to-reach uninsured populations such as rural areas with hopes of driving up enrollment in its second year, several state directors said Wednesday. “We have a much better sense because of data from the federal government on where are the uninsured,” Ryan Barker, vice president of health policy for the Missouri Foundation for Health, said in a conference call hosted by Families USA. The Michigan Primary Care Association said it is trying to “fill the gaps” of health insurance coverage by relocating a majority of its staff to rural, less-populated areas. Daily Caller: The Stupid is strong with this one. The number of Americans signing up for Obamacare coverage on HealthCare.gov slowed significantly in the second week of the open enrollment season for the health-care law. Just over 303,000 people chose plans on HealthCare.gov between Nov. 22 and Nov. 28, down from 462,125 who selected insurance coverage on the federal website during its first week, the Department of Health and Human Services announced Wednesday. ...The number of total applications submitted dropped by half in comparison to the first week. While over one million applications were submitted during the first week, that total fell to just 520,427 in the next seven days. Read more about Daily Caller: The Stupid is strong with this one. Massachusetts continues to steam ahead: Assuming at least 48.5% of QHP determinations have already selected policies, they should be at roughly 26,000 QHPs through last night, plus another 45,687 added to Medicaid. If so, MA has reached 82% of their 2014 total in 18 days, and is on their way to a bare minimum of 134K even without the double-surges around 12/23 and 2/15. Again, I'm expecting as many as 300K Bay Staters before the dust settles in February. On the one hand, moving from 2,000 in the first 3 days to a minimum of 6,000 (likely more like 10K, since the 6K refers only to "accounts" not "people") in the first 17 days is a perfectly reasonable point for Washington to be at right now. Today, the Exchange identified an error affecting 6,000 customer accounts enrolled in Qualified Health Plans. Early analysis indicates that our system integrator, Deloitte, ran an automated enrollment cancellation process in error. The affected accounts, which are a portion of the total number of customers who are enrolled in coverage starting on Jan. 1, 2015, experienced an erroneous cancellation of both their enrollment and payment for 2015 coverage. Well, on the plus side, the rest of the PR makes it clear that a) they're on top of it, b) it's gonna get resolved ASAP and c) it looks like this screw-up was Deloitte's fault, not the actual exchange itself (they call them out by name, which is noteworthy). Based on yesterday's Massachusetts update, I'm knocking my "% selected of total determinations" down from an even 50% to 48.5% on any given day. Even so, 48.5% of 48,902 QHP determinations still means roughly 23,700, up nearly 2K on Monday. As MA's 2014 OE total was only 31,695, this means the state is alread up to 75% of their 2014 total in the first 17 days of the 2015 period. Put another way, at their current rate, MA is on track to enroll a minimum of 130,000 people for 2015...and that would be even without a December 15 or February 15 surge. Meanwhile, MassHealth (Medicaid) enrollment continues to steam ahead, now standing at 41,762 people. CMS announced in guidance Monday (Dec.3) that it will create an “Enrollee Switched List” that allows issuers participating in federally facilitated exchanges to identify enrollees who actively re-enrolled in coverage with another issuer. If you take a look at The Graph this evening, you'll notice two small additions: First, now that the confirmed QHP selections are large enough to actually be visible, I've added them as a permanent feature (it'll be jaggy due to the staggered data release schedule of the various exchanges, especially HC.gov). Second, just for the hell of it, I've decided to add a rough projection for the point I expect total QHPs to hit the 2 million point: December 8th. That would leave just 1 week to add a whopping 5 million people if my "7M by the 15th" projection is to also prove accurate. For comparison, last spring around 2 million people enrolled in the last 16 days of March (plus another 940K during the 15 day April "overtime" period), so it may sound insane to think that 5 million can be enrolled in just 1 week...and if it wasn't for the "autorenewal" factor, I'd agree. However, I'm operating on the assumption that roughly 4 million current enrollees (in the 45 states which are set up for autorenewals) will simply do nothing whatsoever and automatically get renewed all in one shot on the 15th. When I last estimated QHP enrollments for Massachusetts, I assumed roughly 50% of QHP determinations had been selected and thus figured they were up to roughly 19,200 as of the 27th. Today they posted their 2nd official weekly report, and it looks like I overshot a bit (the actual number through the 28th was 18,646). The good news is that the weekly report also includes three more days (through last night). When you tack on the weekend, the grand total now sits at 21,740. Divide that into the 44,446 QHP determinations and the ratio has dropped slightly, to 48.9%. Still an impressive showing through the holiday weekend. For the record, MA has reached about 68% of their 2014 open enrollment total in just 15 days, and is on pace to reach at least 135K by 2/15 (though I still estimate they'll reach more than double that).